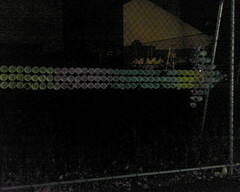 An arrow made from plastic cups in the fence on Broadway, opposite UTS building 10. Quite nicely done. This entry was posted in Photos, Uni. Bookmark the permalink. When did you take this photo? Because there was something like this about two weeks ago. When I passed then, it looked like they were trying to write something, but half the cups had fallen out. There was still an arrow, though. It was taken at the date/time of this post, two Thursday nights ago. There were more cup than the arrow, and I would have taken more pictures, but my bus turned up.